Diversified - This a widely used type of chiropractic manipulation/adjustment that includes most of the procedures taught at chiropractic colleges. This technique is the most commonly used of all chiropractic techniques and is the one that is used the most within chiropractic practices. The Diversified adjustment entails a high-velocity, low amplitude thrust that usually results in a cavitation (popping sound that you may experience). As the name implies, the Diversified Technique can be used to treat many of the joints in the body. 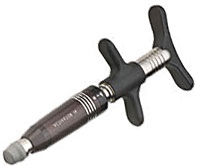 Activator - This is a hand-held, spring-loaded instrument that is used with a protocol. Instead of manipulation/adjustment forces being delivered by hand, force is generated with the small appliance that delivers a lighter, but quicker thrust than can be delivered by hand. Activator can be used as a primary protocol for all patients or a selective method for patients who may not desire manual manipulation or where manual (by hands) may be contraindicated. Cox Flexion-Distraction - This is a specific chiropractic technique that uses mechanical and hands-on manipulation. 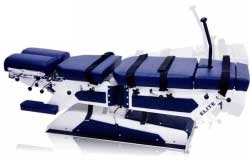 There is a special table that is used where the spine is tractioned and flexed forward. This technique is primarily utilized to treat cervical and lumbar disc herniations, non-disc disorders and to increase mobility of the spinal joints. 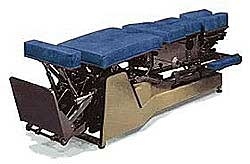 Thompson - This is a specific chiropractic method and is a variation of the diversified technique that uses a special table with several segments called drop pieces. These segments can be cocked up a fraction of an inch, so when the thrust is delivered, the table will drop this fraction of an inch. The drop pieces assist the thrust while minimizing the force used for the manipulation/adjustment. Cavitation (popping sound) of the joint may or may not occur. Logan Basic - This is a specific chiropractic technique which is based on light, sustained force exerted against a specific contact point on the sacrum at the base of the spine. Auxillary contacts at various points in the spine, or along specific muscles. Basic Technique uses the muscular structure surrounding the sacrum as a lever system for balancing the entire structure of the spine. This technique is used to reduce pain/symptoms and restore muscle balance. Sacro-Occipital Technique (SOT) - This is a specific chiropractic technique that uses triangular-shaped blocks usually placed under the pelvis of the patient lying on his/her stomach in order to treat problems identified in the low back. Low force, slow pressure type of manipulation/adjustments are used to address joint problems in the pelvis. SOT may be used as an exclusive technique or as an adjunct method of patient management. Extremity Manipulation/Adjusting - This is the application of chiropractic manipulation to joints other than those in the spine, i.e., shoulder, elbow, wrist/hand/finger, hip, knee, ankle/foot/toe. Examples of what conditions can be treated this way are as follows: carpal tunnel, plantar fasciitis, posture-related problems, etc. Myofascial Release - This is a hands-on technique, which seeks to free the body from the grip of tight fascia, or connective tissue, thus restoring normal alignment and function and reducing pain. Using their hands, therapists apply mild, sustained pressure to gently stretch and soften the fascia. Myofascial release is used to treat neck and back pain, headaches, recurring sports injuries and scoliosis, among other conditions. Cold-Laser Therapy - This is simply a form of energy that is applied to human tissue to stimulate a physiologic response. Similar to other therapeutic modalities it resides on the electromagnetic spectrum. When light enters the cell, certain molecules called chromophores react to it, and trigger a photochemical reaction that leads to desirable physiological effects and clinical treatment outcomes. These include the stimulation of collagen synthesis, the stimulation of ATP production, the acceleration of the inflammatory process and thereby wound healing, the decrease in inflammatory pain and swelling, and the increase in lymphocyte activity. Ultrasound Therapy - A therapeutic modality that utilizes high frequency sound waves to produce pulsing/ micromassage and deep heating effects in the body particularly to muscle tissue. This works because of the sound vibrations, as fast as a million per second, which penetrates the tissues deep in the body, creating a heat response. These vibrations and heat help break down and disperse unhealthy tissue accumulation. Interferential Stimulation Therapy - A therapeutic device that sends electrical impulses to the nerve/muscle using pads that conduct these impulse through the skin, producing a tingling sensation. This low frequency stimulation that is produced prompts the body to secrete endorphins and other natural pain killers to help relieve pain. The treatment is used to increase circulation, decrease pain and muscle spasm, and facilitate healing of injured soft tissue. Cryotherapy - Application of cold packs to decrease circulation and edema in tissues, will decrease the perception of pain. Hydrocollator - Application of moist heat to increase circulation and relax musculature, which will decrease the perception of pain. Gua Sha - It is an East Asian healing technique. It involves palpation and cutaneous stimulation where the skin is pressured, in strokes, by a round-edged instrument; that results in the appearance of small red petechiae that will fade in 2 to 3 days. This ancient method helps with blood circulation and removal of toxic heat, stagnant blood and lymph fluid from the body is an extremely effective method of improving ones health. Hydrotherapy Massage - Hydrotherapy treatments combine massage, water and heat in a single dry hydrotherapy massage system. This water jet massage allows the user to stay clothed and dry; providing a comfortable dry water massage.